While you might think of creamed corn as the food that comes in a can, this cream cheese corn will have you thinking about creamed corn in an entirely new way. Frozen corn can be tasty, but it's not exactly an inspired side dish. 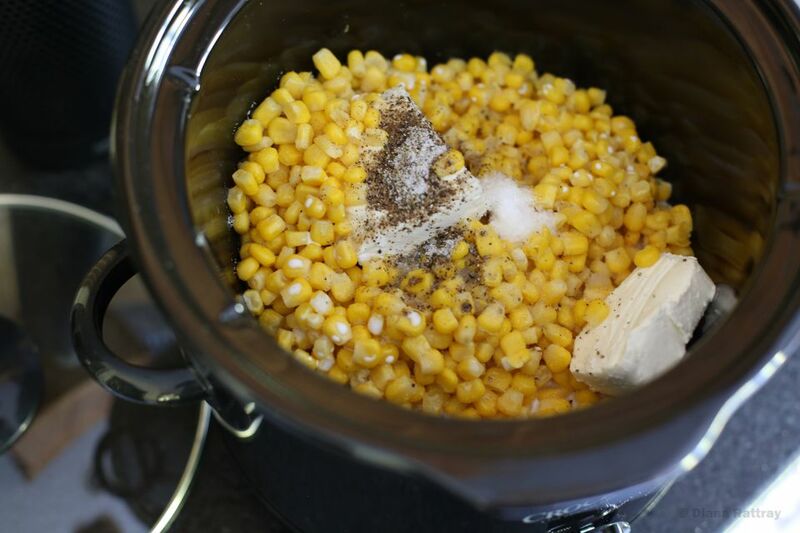 If you put it in the slow cooker with butter, cream, sugar, and salt, though, the corn transforms into a vegetable dish that the whole family will love. Melt cream cheese and butter in the microwave. Stir to blend. Spray the bottom and sides of the slow cooker with nonstick cooking spray. Put the melted cream cheese and butter in slow cooker. Add corn, sugar, salt, and pepper. Stir to blend ingredients until the corn is totally coated with the other ingredients. Cover and cook in slow cooker for two hours on low. Stir and check the consistency. At first, it might look the sauce is separated, but if you gently stir it, it will all come together nicely. If you want the sauce to be a little thinner, add a couple more tablespoons of cream. Taste and season with salt, pepper, and paprika. Serve immediately. For extra color and flavor, sauteed chopped bell peppers and onions may be added to the corn. Some other ingredient ideas include chopped pimiento, green onions, snipped chives, bacon, or diced ham. The sauce will thicken as it stands. If you're serving this at a party and letting it remain in the slow cooker on the "warm" setting, occasionally stir the corn and add a bit of cream or water to thin it back out. Substitute three cans (12 to 15 ounces each) of drained whole kernel corn for the frozen corn. Whole milk or half and half can be substituted for heavy cream. Stovetop creamed corn: Melt the butter and cream cheese in a medium-sized pot over medium heat. Add the cream, corn, salt, and pepper, and cook until everything is melted, combined, and warmed through. Baked creamed corn: Combine all the ingredients in a greased 9x13 baking dish. Use a spatula to even it out on the top. Bake at 350 degrees F until the sauce is bubbly around the edges. Bacon creamed corn: Saute four slices of bacon and add them, plus the drippings, to the slow cooker. Stir well to combine before cooking. Cheesy creamed corn: Add 1 cup of shredded cheddar cheese to the slow cooker. Spicy creamed corn: Add 2 tablespoons of fresh jalapenos with the stems, seeds, and membranes removed. Mix well into the slow cooker to combine. Southwestern creamed corn: Add one 4-oz. can of diced green chiles, two diced bell peppers of any color, 1 tablespoon chili powder, and 1 teaspoon ground cumin.